Guess which boxes were unpacked first in my new home? Did you guess photo albums? Ding! Ding! Ding! You are a winner! I love all my photo albums but recently realized an album is more than an album. It’s more than photos. Every album tells a story. Any one of these albums I can open and start telling you a story of what we were doing at that trip or event or milestone. So today I decided to rename albums. I think they should be called “Story Keepers”. One of the new items I offer at Silver Paw Studio is an 8×8 Story Keeper. 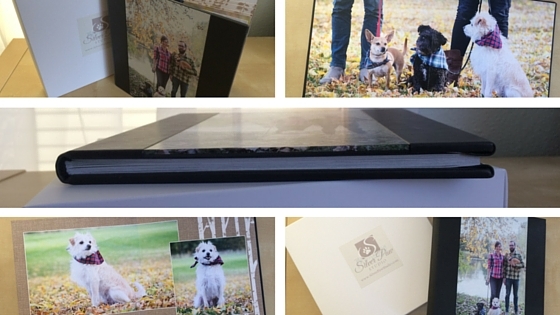 These beautiful albums can showcase around 25 of your favorite images from your portrait session. I can even print a featured image on the cover. I love how thick the pages are and the weight of it in my hands. I love that I deliver it to you in a special box. But I especially love the stories the pages tell. In this session I remember the entire family including the dogs wore plaid. The dogs were so silly hoping to chase squirrels all over the park. We were blessed with a beautiful day with pretty evening light. That’s my story from this session but I’m sure the family has many more stories they could tell. One of the advantages of a book or an album or a “Story Keeper” is it takes no room on your wall. I am a huge fan of printing and hanging images on your wall of course. But sometimes you only have a small space. Perhaps you’re in a transition from one house to another. Maybe you choose to live tiny. Maybe you have a super open floor plan with lots windows and you may not have room to display all of your favorite images from your session. 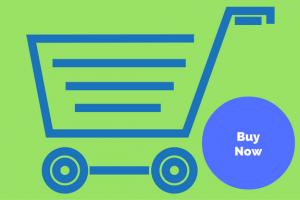 This is where a Story Keeper can fit right in with your needs. Display on a table or on a bookshelf and leaf through at your leisure. They make great treasures for you and a thoughtful gift for your friends and family. 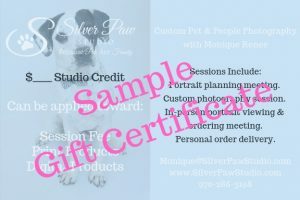 As with everything you experience at Silver Paw Studio your Story Keepers will be customized. There are themes and colors available for any taste. When you schedule your free portrait consultation with me you will see and hold this album “Story Keeper” for yourself. 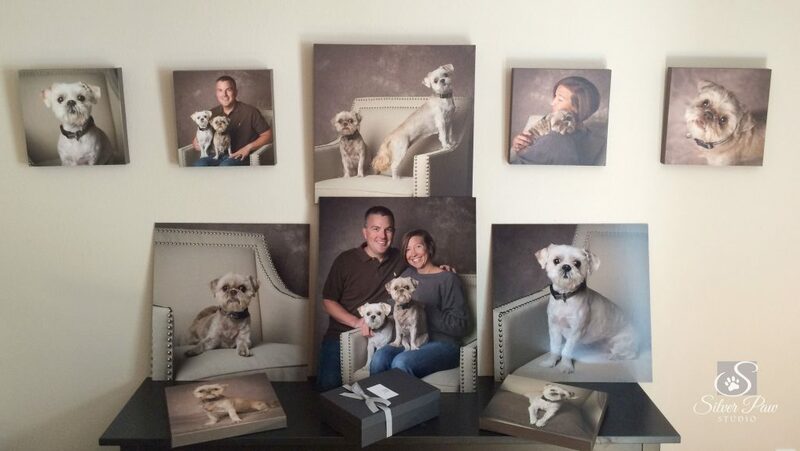 Now that you’ve had your pet and family portraits created what should you do with them? At your consultation with me we will have talked about some ideas but it’s easy to be overwhelmed when presented with all your beautiful images. 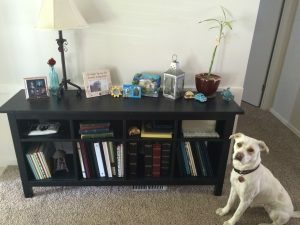 Important questions to ask yourself before you sit down to look through your gallery of images with me is where your portraits will be displayed in your home and who and where else you might want to have your portraits. The first place people think is displaying framed prints and canvas wraps on their walls. 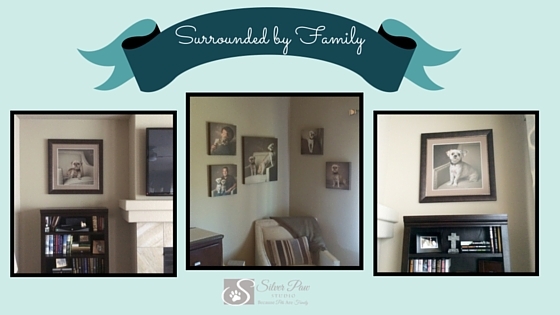 Our studio has a special program that can show you your portraits on your wall. All you have to do is tape a piece of printer paper to the wall, snap a photo of the entire wall on your cell phone and text it or email it to me. Then when all of your pictures are ready to view we can see your favorites on your wall at the right size. Now that we have your house decorated who else would like some of your new portraits? This is where a little bit of thought ahead of time comes in super handy. Storyteller albums are about 25 of your favorite images presented in a custom album. These are great for your own home and consider giving them as gifts. They’re ideal for Mother’s or Father’s Day, birthdays, holidays like Christmas or as a surprise gift. Often people order prints for their office or desk, parents and grandparents, and even digital copies for business. What about greeting cards? Maybe you need Christmas cards, graduation announcements, family reunion cards, save-the-date, or birthday cards. We design custom greeting cards for any occasion. Here is a handy Dream Sheet you can fill out before your viewing and ordering appointment. It will help you organize and prepare for who all might be on that special list to receive your portraits. In this blog post once you have your prints home here’s how you can easily hang them on your wall.